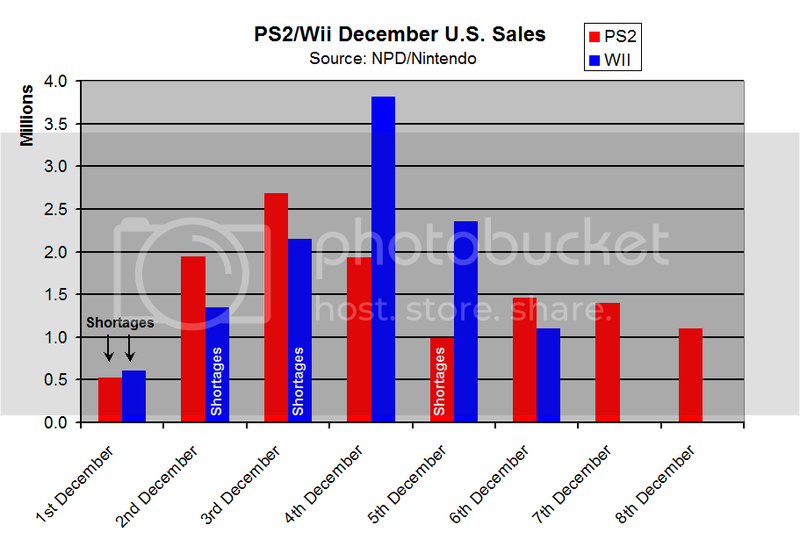 Numbers look terrible (Nintendo not so much, but still) for a December Christmas Holiday period. BRiT and Dr Evil like this. Those are ratios that compare themselves against Nintendo's "1". Down 32 and 24% respectively? That's painful. How does November compare? Did more people just move their buying up earlier? I adjusted that before you posted... or a minute after anyhow. I guess we need Nov+Dec combined to be compared. That should mean the consoles have peaked, have one mediocre holiday period left, and then maybe a couple of years of low sales. Unless there's a shocking and much needed price cut akin to the PS2 Slim, there's no extra longevity to be found in this gen.
goonergaz, Silent_Buddha, Shortbread and 3 others like this. Hardware sales wise, but as we both know software and operating income wise that could be a different story. As we both know for SIE this fiscal year will probably have another billion+ operating income due to good software revenue (partial thanks digital providing bigger cut for Sony vs royalty & of course dlc/microtransactions) and all that service revenue. And we both know operating income will be higher this gen and I personally think this will continue to be the case in the 6th 7th year (higher than PS2) because of digital/dlc/microtransactions and service revenue. Data about software unit sales of PS2 vs PS3 vs PS4 would be interesting, iirc though there probably insn't enough data to do much comparisons. It's an NPD hardware sales thread. -Sony literally had zero promotions in December this year. They seem to really be focusing on profit. I thought they would at least temporarily drop the price to 249/349 like they did last year IIRC. -XB1X launched last year around this time. -Cyber Monday was included in November's report this year according to Era, so that probably affected December numbers across the board. -And if you combine sales for Nov.+Dec., Sony seemingly limited 199 bundles on BF/CM like they did the year prior. They could have easily sold way more units had they made more available. So it's difficult to say if these are signs of slowdown. XB1 is likely down due to XB1X launching last year. PS4 could be down due to a lack of promotions. But I think it's likely that sales will start to wind down from here on out for PS4/XB1, which are now entering their 6th year on the market. lefantome and DrJay24 like this. Holiday + Nintendo + Super Smash Bros. Ultimate = top of the charts. That one should surprise no one. So it likely wasn't only Nintendo Super Smash Bros. fans picking it up. Not surprising as the title is very accessible and gets a ton of word of mouth. So someone finally supplanted Halo: Reach for sales in a launch month for an exclusive in the US. Impressive. Also impressive that Halo: Reach held onto the title for that long considering some of the PS4 exclusives that launched this year. And that was without digital sales numbers. So only Nintendo knows by just how much Super Smash Bros. literally smashed by all other exclusive launches. Speaking of Nintendo, they took 7 of the top 20 spots with single SKU (exclusive) titles. Again no surprise, as Nintendo almost always does well during the Holiday shopping season. I think Marvel's Spider-Man is the only other single SKU title in the list. Unfortunately they didn't post any of the other charts that they usually post. RDR2 remains the top selling title of 2018.
pharma, Goodtwin and BRiT like this. Switch is doing well in the US thanks to positive buzz they got since launch that was substained by launching all their stronger IPs in less than two years. This helps keeping the Switch selling about as much as the 3DS worldwide because in Japan Switch is far behind compared to 3DS alone. It will be interesting to see if it will be able to keep those sales worldwide and which effects the inevitable 2019 price cut and new skus are going to have. I hope they will release a cheap (200$) Switch Tv sooner or later. What's also potentially interesting depending on how the market goes and what titles get released for NSW is that while PS4 and XBO are likely going to be declining in sales now, the NSW sales might still be on the rise throughout next year. Of course, if Nintendo can't keep people interested that might not happen. But as it also functions as a handheld, I don't think we're going to see sales start declining just yet. Nintendo would be screwed if NSW sales followed XB1/PS4 considering it released 4 years later! It should be on the rise and peaking a couple of years from now if it's not going to be a flash-in-the-pan failure. Like the WiiU. Which was the actual ps4/xb1 competitor in terms of generations of home consoles. We shouldn't forget that Switch canibalized the wiiu and the 3ds, as it replaced both at the same time. As of now Nintendo exists in their own market segment. They leveraged their continuous dominance of the portable market into a hybrid console. Still it just begun, they can easily stretch the switch into a very long generation with their own version of a mid-gen refresh in a year or two. I didnt think the WiiU was selling in enough quantities to be considered "canibalized". Pixel, milk and tongue_of_colicab like this. I forgot it sold 13M lifetime, almost half of it was the first 14 months, then it crashed long before switch was announced. People just continued playing with their wii (as people do) and upgraded to the switch. But you do have a point of it drawing from the 3DS market that is huge, over 73 millions [ https://www.nintendo.co.jp/ir/pdf/2018/181030e.pdf ].